This “Baked Goods Sampler” gift basket full of tempting gourmet treats is perfect for any occasion! 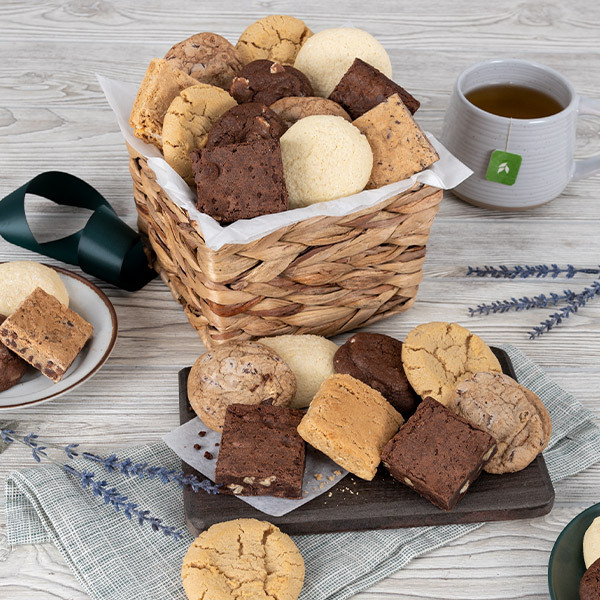 Inside one of our signature baskets, we've brought together some of our favorite baked goods, like luxuriously rich brownies and irresistibly crisp cookies, creating a selection that's perfect either as a gift or for entertaining guests! Didn't experience first hand since it was sent as a get well to friends. They loved the fudge and cookies. We can attest that the basket was delivered timely and efficiently. I ordered a rush delivery of cookies for my brother and sister-in-law who were both ill and they were so surprised! They said they were all delicious! I got this for my grandchildren for Valentines Day. They loved it! This was the perfect thank you gift for a long distance acquaintance. Even though the first delivery didn’t make it to its destination, customer service was pleasant and helpful, and expedited a second delivery immediately. I bought these a few weeks ago for my husbands birthday and he absolutely loved them! There was a great selection and very easy to order. I purchased this cookie basket for my dad’s 95th birthday and had it sent in time for him to receive it in his big day. The day before his birthday, I got an email with the tracking info and was horrified to see that the delivery date was three days after I thought it would arrive. Although I didn’t think anything could be done, I decided to call Customer Service and see what they would say. The wonderful representative immediately ordered a replacement basket to be delivered to my dad the next day!! And it arrived bright and early the next morning!! I was impressed and surprised by this company rising to the occasion and doing the right thing (a rarity these days) and the delay in the delivery was the fault of the trucking company...not Gourmet Gift Baskets! I usually use a different company for my dad’s gifts but decided to try Gourmet this time and I’m so happy he did!! Thank you for your wonderful attention to your customers! And my dad is still RAVING about the cookies! Great job! I will recommend you to everyone I know. You have a new customer for life!!! Wonderful arrangement of sweet treats but the card was left out to the recipient! Sent this to a friend. He enjoyed it. Said the basket was nice and the cookies were awesome. I sent this to a family member out of state to cheer her up and help in her recovery from having a knee replacement. Everything arrived exactly the day it stated in the order and she really loved everything! I ordered this basket for my mother's 91 birthday. She raved about everything in this basket. At 91, I would say she knows her treats. This gift basket has a great selection and the delivery was exactly as ordered. I was able to pick the date to deliver this which is exceptional service. Hard to find a gift basket for my husband and this was perfect, he said it “felt like being home”. Purchased a basket for my Grandfather about a week ago. He and my aunts enjoyed the goodies. Great quality. I bought this basket online and had it sent to my brother and his family. I included a note indicated may appreciation of him and his family's visit. Since I didn't hear from him letting me know that he had received the basket, I text his wife to make sure they had received it. My brother then called me to let me know that they received the basket but did not know who the basket was from...my note was not included. However, they said that the cookies taste good. I was very disappointed that my note was not included so I don't think I will order from them again. I sent this as a birthday gift to my husband at work. He loved them, even shared them with his co-workers. He also said they were really fresh and delicious. My brother lives in the mid-west. My dad and I really missed not being able to see him for his birthday. Brother was delighted to receive this gift. He froze some of the cookies, and kept others to "eat now". He said he has a future use for the basket, too. I had hoped he would like it, and indeed he did. Thank you for bringing the three of us closer together for his special day. He almost missed the card though, because it was sealed under the packing slip instead of being inside the box. He liked the photo, but my cropping instructions were not received evidently, because the whole photo was included instead of just my dad and me. I ordered a gift basket of baked goods for my 85 year old mom and had them delivered to her nursing home. She absolutely loves them! I was so happy to be able to add a little sweetness to her life! I was selfish and ordered it for myself after I had a surgery to cheer up. I didn't expect much and got really surprised with freshness of the goods! Also I liked the fact that everything was individually wrapped and labeled and there was a brochure with nutrition facts and allergies information. And I didn't feel that the basket was small it felt just right. I would DEFINITELY recommend. I sent this basket to an employee who had lost a loved one, to compliment a donation made to a non-profit of the family's choice. She loved the cookie basket, loved the assortment and quality of baked goods. I bought the baked goods sampler for my best friend for her birthday. She said her and her family enjoyed every treat. They came beautifully wrapped and fresh. I highly recommend this gift basket. I will happily order It again. Gifted this to two coworkers who work at a location different from mine, so I never laid eyes on the basket. However I heard a ton of comments about how nice the basket was packaged and how tasty the baked goods were from the recipients as well as from people who work in cubicles near them. I'd purchase again, no question. I bought this as shift for my parents and they really enjoyed it. I sent this as a gift to a friend of mine who was recovering from a surgery. She LOVED it and said all the baked goods were delicious and fresh. I was out of town caring for my aunt so I did a google search for something I could send my husband for Father's Day, since I wouldn't be with him that wasn't flowers. I came across this cute basket full of baked goods and I'm glad I did. He loved all the goodies that came in it! Everything was fresh, individually wrapped and sealed with the item description clearly printed in the bottom corner of the package. The brownies were his favorite but the cookies are delicious too! If you've never ordered, do it! You won't regret it! I had this delivered to my step dad for Father’s Day. He’s a sweet fanatic and he absolutely loved this! Just enough but not too much. The sweets were top notch! 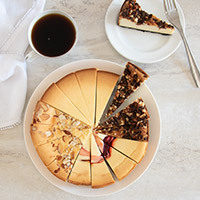 I’ve ordered from Gourmet before and the results are always the same...delicious and much appreciated by everyone I’ve ever sent a gift basket to! Thank you so much! I will always use Gourmet Gift Baskets over all others! I purchased this basket for my Godmother and she loved it! The arrangement AND the quality of the baked goods she said was delicious! I bought this basket for my mom for mother’s day. Wanted to send something a little different than what I would normally send. She was very surprised and happy that I sent her baked sweets. Only one issue, she said it was kinda small. That I wasn’t aware of when I ordered it. Looks bigger in the picture in my opinion. Oh well! I know better for next time. Lol! My Mom loved the cookies and brownies for Mother's Day. The cookies were especially good she said, but that is her favorite anyway. This basket was a Mothers Day gift and they loved it. We were told they could sit there and forget everything else when they are eating these treats! Wonderful gift! I sent these to my Mom for Mother’s Day and she loved them. She said they were so good and fresh! I got this for my birthday and it is Fantastic!! Fresh. 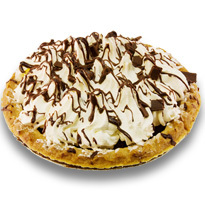 tasty, Sinfully delicious! I will for sure be ordering gifts from Gourmet Gift Baskets from now on! Dad lives in Pennsylvania, we live in Texas, he has a sweet tooth, so what better to send him for his birthday! He loved it!! I sent the baked goods basket to my son for Easter. He said everything in it was fresh tasting and delicious. I did have a delivery issue but it was promptly and courteously taken care of. I sent this baked goods sampler to my mentor, to thanks her for all of her help. She said they were the best cookies she's ever eaten. I bought this basket for my mom for Valentines Day. She just finished the last brownie and commented that it was just as delicious as the first one. Very nice basket. Loved that the cookies were packaged separately. My mom grabbed a brownie before all the wrapping could come off! She and my dad loved it. Every sample was delicious. Warming them very slightly in the microwave took them close to Five Star territory. I bought these as a gift so I can't vouch for the quality, but they are packaged nicely and the delivery was very timely. We needed a gift shipped overnight but it was already so late in the afternoon, many companies could not ship on such short notice. Browsed online and found this website. Not only were they able to still ship for the very next day, they had a million things to choose from. We chose the baked Goods Sampler Gift Basket and the recipient tells us they were very yummy. We are very happy with GourmetGiftBaskets. We will be using them again. Gave the basket to a family friend going through a tough time. They said it was a lovely gift and delicious too. I was happy to receive the delivery notice. Great service. I got this basket as a gift a couple weeks ago and after some complications with shipping, I received this nice variety of baked goods. The variety was nice and very delicious. I also enjoyed how the baked goods were labeled so I knew which treat I was eating. If there hadn't been complications with shipping, I would be very satisfied. I bought this as a Father's Day gift, simply delicious. I bought these for my parents and they loved them! 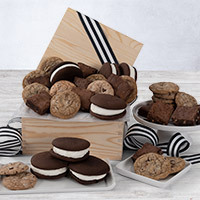 I bought the cookie assortment to send to my son for his birthday and it was a big hit with him and his co workers. Gourmet Gift Baskets provided great quality, service, and communication. I would definitely order from this company again. Purchased this on Wednesday and requested delivery for Friday (of the same week) as a Fathers Day weekend "kick off" gift. It arrived, perfectly packaged, right on time! The basket itself is high quality. The contents are divine! Fresh, flavorful, and individually wrapped, this sampler is a great gift. It offers plenty of variety and is sure to please. He didn't want to share with anyone but luckily I get all access. My husband LOVED it!! Will definitely be ordering again in the future and I certainly recommend Gourmet Gift Baskets!!! I bought this for my mom for Mother's Day. She loved it. Quality was good and so were the cookies. I bought this for my mother for Mother's Day. She loved it! Each treat was individually wrapped and she said the baked goods are delicious. I bought the goodie basket for my dad's 86th birthday. He was so excited to receive his yummy baked goods! I ordered on a Friday & it was delivered Monday! Thank You!! I wanted to try a different company with better prices and offerings. Very happy! My Mother couldn't stop raving about the tasty cookies and brownies. One thing she enjoyed was that the treats were individually wrapped. If they weren't, the different flavors would mingle and not taste as good. She loves her basket and plans to use it decoratively in her home. I was so happy to hear how good the overall product was. I'll use Gormet Gift Baskets again, maybe even a treat for my family. Thank you! I bought this as a gift for my sister and she's sent me updates every time she eats a different sweet! Needless to say, she was very happy and the shipping was quick just as promised. 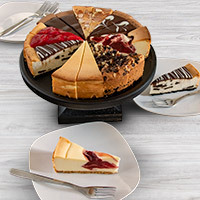 We ordered this for a family friend who lives away from us and we couldn't attend the funeral. They said it was wonderful and delicious. Bought this for my son for a holiday present. Home baked goods for himself and to share... he said they were delicious and he loved having them over the holidays to share. Sorry no pictures. I bought this for my mother for her birthday and she loved it! I bought this to send it for a birthday. Happy to have been able to choose the right date to have it deliver. I purchased a gift basket for a relative who had just started college. The gift basket was lost in transit, so I called customer service. The woman who I spoke to was extremely helpful--she tracked down the package and was extremely courteous and efficient. I have purchased this basket as birthday gifts several times over the past few years. Has a nice vatiety of goodies. Always a hit! Bought this as a father's day gift. It was a success. I sent this to my niece for her 50th birthday. She said it was great and that it was a gift the whole family could enjoy. I sent the bakery gift basket to a really sick friend! It arrived in a good amount of time! My friend told me that it was delicious and she finally smiled as she ate it! I sent this to my mother for mothers day. She loved them. It is a great gift for someone who has everything. I think I might order myself a basket next year as well. I sent this to my mother and mother in law and they both loved it! My only complaint is that on the delivery date the person has to be there to receive it otherwise the basket will remain on the doorstep for anyone to steal. Luckily, someone got there shortly after and the gift was a hit! Recipient called immediately to thank me for "the awesome gift Basket." I sent this basket to a Facebook friend for her birthday as a surprise. She was so excited, I guess it worked... Lol Her response and I quote: "I love cookies! And this was such a nice surprise!! Omg, there's brownies... These cookies are Amazing"
I sent this to a friend who recently lost her dad. She said THANK YOU for the delicious cookies and brownies. An awesome value and impressive product! Bought a couple of weeks ago to be delivered on a specific date during exams! Arrived right on schedule and my son and his friends have thoroughly enjoyed!! It was very important to me to have the gift basket delivered within 48 hours. I paid for expedited shipping and was very happy with the timely result! The cookies looked delicious and I am told by the recipients that they were indeed very yummy! I sent this to my daughter at college for Easter instead of candy. She said everything in it was so amazing, she didn't want to share it with her roommates. She was surprised everything was so delicious and soft. Specifically, she said, it was the bomb! Sent this basket to a family who lost a teenager---I was told the basket was too nice for them to put out for their guests--they were saving it for themselves! This is the second time I sent a sympathy basket from this company and I have not been disappointed. Highly recommended!! I bought this for a clients and had it delivered to their home. They called me and said they absolutely loved it and everything tastes great. I bought this basket for my Great Aunt's 88th birthday. Shame called to thank me, appreciating that they were delicious and individually wrapped so they would keep fresh as she lives alone and should not eat too many at once. She had eaten a brownie and while we were talking opened a peanut butter cookie and excitedly told me "ooh peanut butter, I love peanut butter cookies!" Ordered for my husband. He enjoyed it. Said they were very rich but very good. I was told by my friend that the basket was lovely and the cookies were delicious. So I am very pleased about that, since this was my purchase. I sent it to my sister on her 30th birthday and she loved it. She said everything tasted great and was freshly baked. I sent this basket to a friend for the loss of a loved one. She received it exactly on the delivery day and everything was fresh and delicious. She was so touched by the gift because it is so aesthetically pleasing and the cookies and brownies were delicious! There was a good variety of the product so everyone in her family was able to enjoy the delectable goodies! This basket was able to brighten her day and she could not stop raving about how beautiful and delicious it was! I definitely recommend this basket!! And I will most definitely be purchasing from this company again! (perhaps even for a little treat for myself)! Overall I was incredibly pleased with this purchase and will be ordering from gourmet gift baskets a lot in the future!!! All the product in the basket were delicious. The quality of the products are excellent.